Last week just as Swiss pharmaceuticals giant Novartis was set to begin its final arguments in the Supreme Court against the rejection of a patent for its cancer drug Glivec (see ‘Evergreen Novartis’, Down To Earth, September 1-15) there were two swift and stunning developments. A letter was written by five activists complaining to the ministers of law, commerce, health and family welfare about Justice Dalveer Bhandari, one of two judges hearing the case. The complaint was that Justice Bhandari had been attending international conferences on intellectual property (IP) matters organised by the Intellectual Property Owners Association (ipoa), a lobby group of the world’s top IT and pharmaceutical companies of which Novartis is a member. The letter was written on September 5 and a report in The Times of India quoting from it appeared the next day. 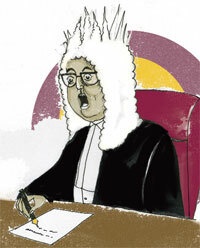 Within hours Justice Bhandari had recused himself from the case. Recusal is to remove oneself as a judge in a particular proceeding, usually because of conflict of interest. However, no reasons are given when a judge recuses himself. This was the case last month when Justices P Sathasivam and A K Patnaik recused themselves from hearing the corruption charges against dmk Member of Parliament Kanimozhi. Recusals in IP cases, though, tend to be more interesting if not controversial for several reasons, not least because global giants are involved in these suits. Justice Bhandari is the second Supreme Court judge to recuse himself from the Novartis case, the first being Justice Markandey Katju. In both cases, the views expressed by these judges on IP laws, one in a Supreme Court journal and the other in a presentation made at the International Conference of Judges hosted by ipoa, had a bearing on their decision—voluntary in the case of Katju—to remove themselves from the Novartis case. What the drug giant has been challenging is a crucial section (3d) of India’s patent law that bars drug companies from patenting new forms of a patented substance unless it can prove gains in efficacy. This is aimed at preventing IP owners from extending their patents through incremental innovations that do not add much value. It is part of India’s attempt to balance the rights of patent holders with public healthcare interests related to access and affordability of medicines in a largely poor country. The law in that sense is unique in many ways. Justice Bhandari is a keen proponent of IP laws and had attended a UN conference on the subject even in the 1990s. Going by the article that the activists’ letter has cited, the judge believes that “there is urgent need to educate the masses regarding importance and benefits of protection of IP Rights” and that pharmaceutical and other patent holders from developed countries “have bounden duty and obligation to educate people” by organising seminars, symposia and debates. The more contentious part of this otherwise pedantic article is his exhortation that “they must make all efforts to ensure that all countries are persuaded to enact proper laws”. Would this imply that India did not have “proper laws”? Or was it a general recommendation that he was making? He also thinks the World Intellectual Property Organization has a signal role to play in this crusade. Justice Katju’s world view on IP appears to be the exact opposite. In the 2004 article written just before India introduced product patents as required by the World Trade Organization, he writes: “A balance has to be struck between the need to give monetary inducements to new inventions and making available these inventions to the broad masses in the underdeveloped countries at affordable prices.” The larger backdrop to this controversy is the sophisticated lobbying that has been taking place in India over the past seven-eight years to “educate” judges on the benefits of IP protection. It’s not just IP owners but also American law schools which are involved in the exercise to superimpose the developed world’s model of IP protection on India’s more balanced laws (see ‘Insidious India Project’, Business Standard, March 4, 2010). This column has been regularly highlighting the implicit dangers of such indoctrination (see ‘Why do judges need to be ‘sensitised’?’, Down To Earth, August 15, 2010). But the question here is whether either of these articles has an appearance of bias that would influence judgement. While the jury is out on this, what is clear is that we need more comprehensive guidelines on judicial transparency in determining issues of conflict of interest. It cannot be just a declaration of their wealth. It also has to be a listing of the facilities (free hospitality for spouses, for instance), gifts and honorarium that judges receive while attending conferences and lectures. What is equally important is for everyone to know who the organisers are and what their agenda is. In many a case the judges themselves are clueless on this.